This is a crustose lichen with a scurfy-leprose thallus, bright to glaucous green in colour, becoming dirty grey. 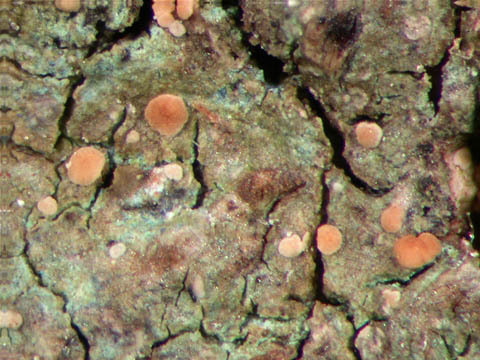 Apothecia are bright pink-orange to a piebald brown, 0.1-0.3 mm diam., occasional, semi-immersed, rarely becoming sessile. On very shaded, base-rich bark and inside old hollow trees, especially elm, ash and willow. Also very old oaks in sheltered wayside and woodland sites and by water. Rare but widespread throughout Britain, also France, Denmark, Norway, Spain. Coed Cwm Cletwr: With Agonimia allobata on decaying bark of Tilia cordata, alt 60m and On shaded damp bark on NE side of Fraxinus excelsior in gorge E of minor road bend at E end. Coed Nant Llolwen: On damp Fraxinus excelsior bark at base of tree in stream ravine woodland. Coed Cwm Einion: On partially decayed spongy bark of old streamside. Trawsgoed: On shaded bark on ancient Fraxinus excelsior. Coed Rhiwbren Fawr: On shaded rough base-rich bark on trunk of old Quercus in sheltered valley woodland. Coed Dolgoch Falls: On decaying Fraxinus excelsior bark.